thus the value of congestion becomes subjective in nature. are used for the estimation of road traffic congestion . volume to capacity ratio is removed. 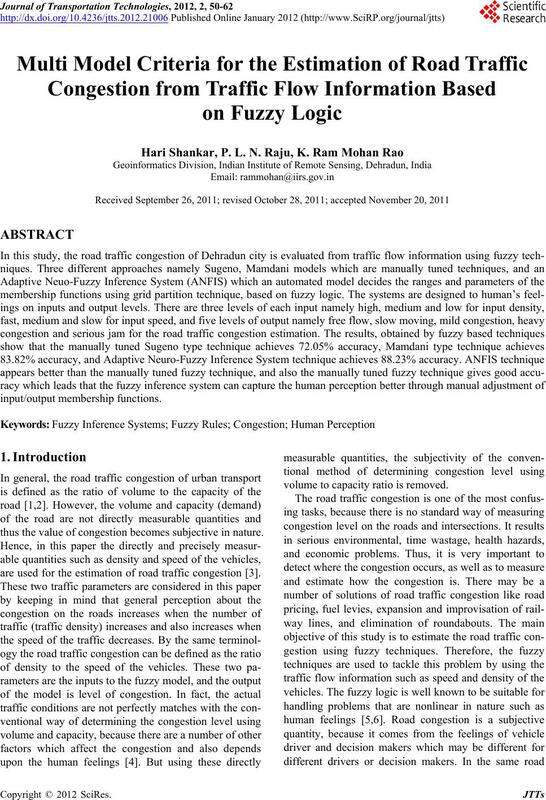 but in this study we use only two traffic parameters i.e. speed and density, which affect mostly to congestion. system outputs against human opinion. taken as a test case to quantify the road traffic congestion. logic to determine six discrete levels of congestion . 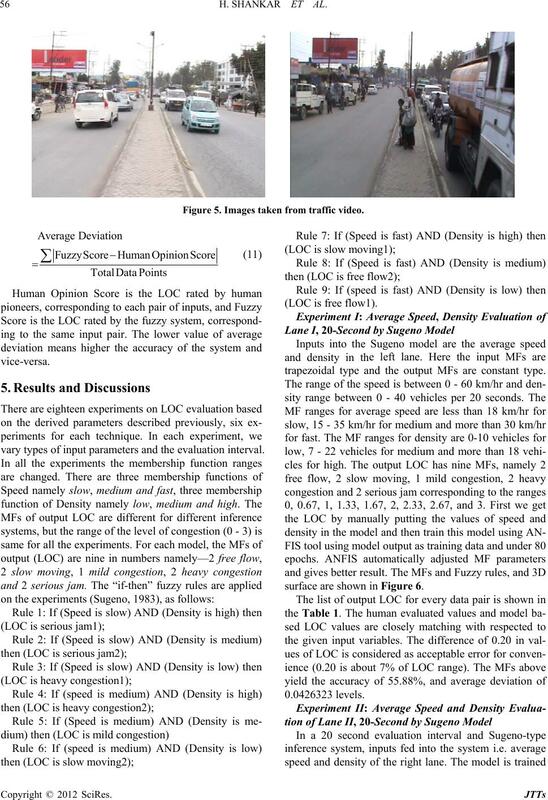 The system use velocity and vehicle density as inputs its. 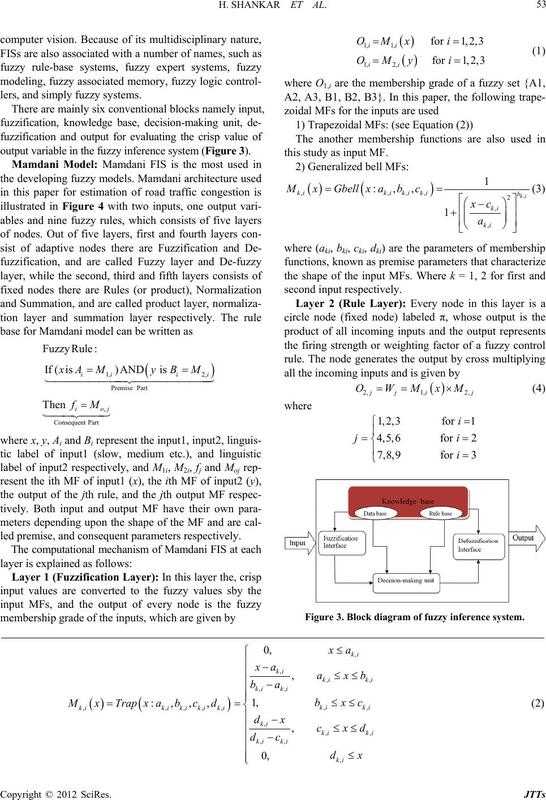 deciding the ranges, and types of membership functions. are extracted from a video file using manual technique. each lane of the road in every time interval is obtained. Figure 2. 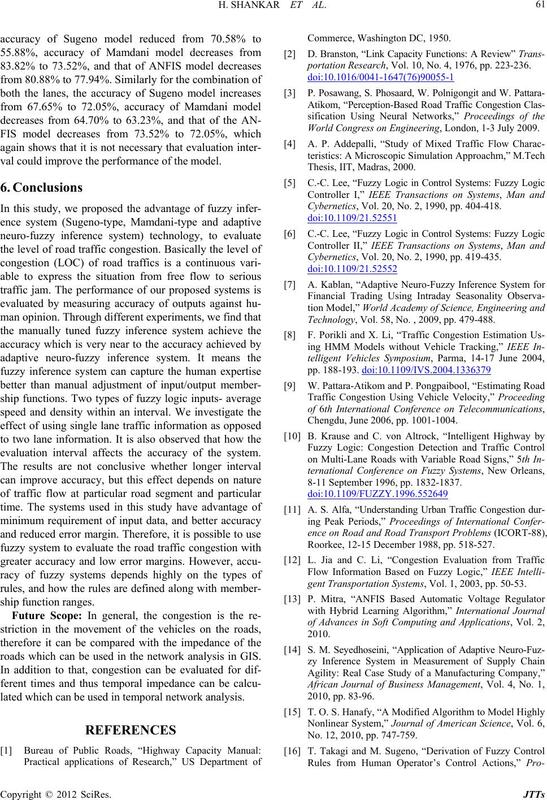 Methodology of fuzzy inference systems. lers, and simply fuzzy systems. output variable in the fuzzy inference system (Figure 3). led premise, and consequent parameters respectively. this study as input MF. Figure 3. 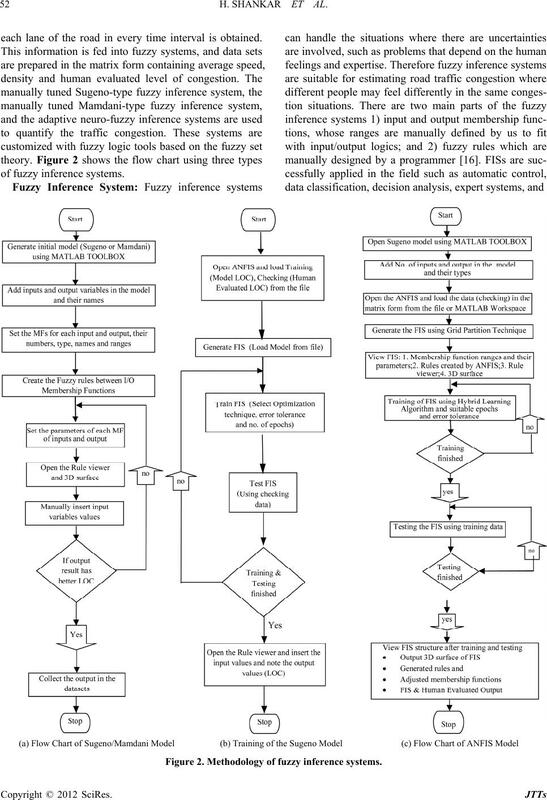 Block diagram of fuzzy inference system. Figure 4. 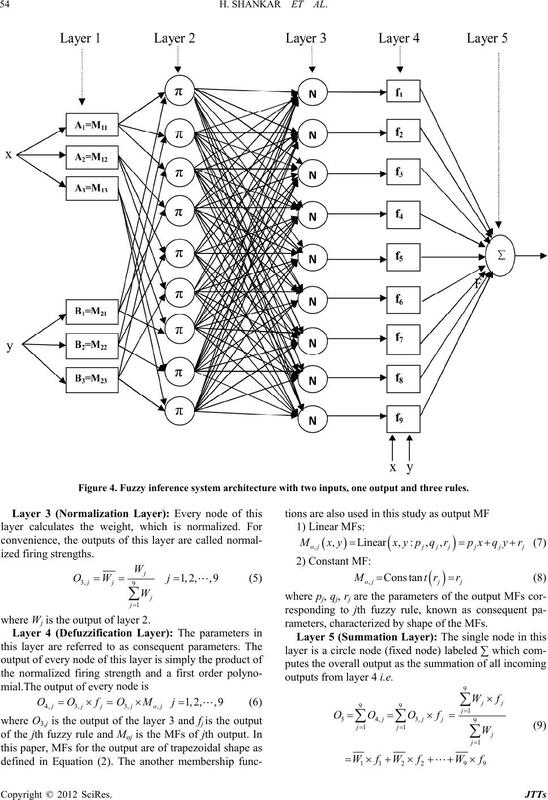 Fuzzy inference system architecture with two inputs, one output and three rules. whe utput of layer 2.
outputs from layer 4 i.e. like trapezoidal, triangulat, Gaussian, exponential etc. ry 40-seconds interval of Lane I & II. Figure 5. Images taken from traffic video. nd the output MFs are constant type. ry types of input parameters and the evaluation interval. surface are shown in Figure 6. Figure 6. 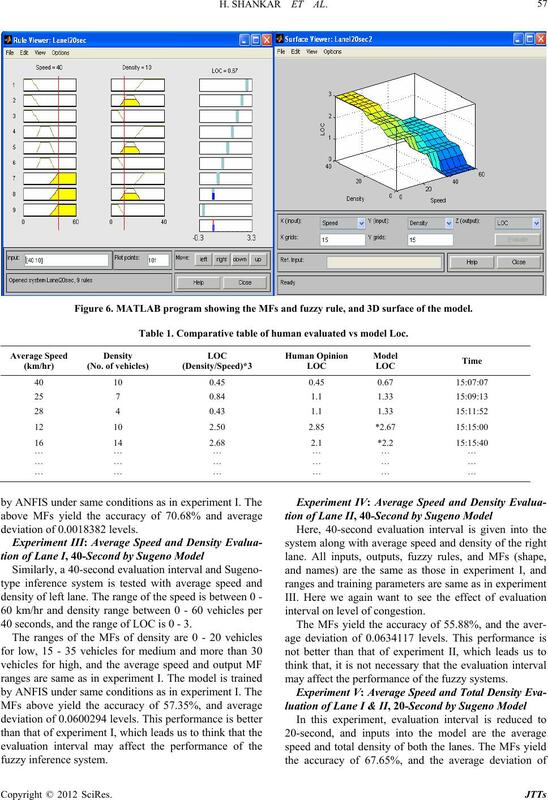 MATLAB program showing the MFs and fuzzy rule, and 3D surface of the model. Table 1. Comparative table of human evaluated vs model Loc. 40 seco and the rang LOC is 0 - 3.
may affect the performance of the fuzzy systems. age deviation of 0.1115213 levels. the average deviation of 0.0917643 levels. Figure 7. 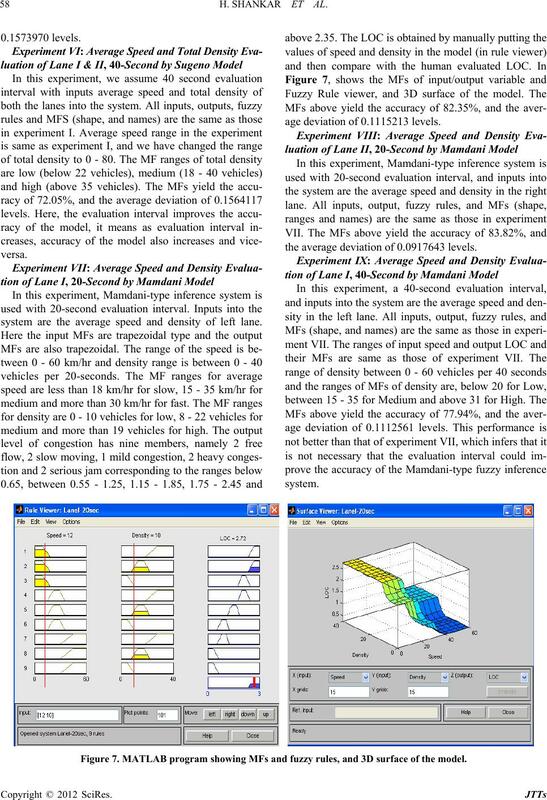 MATLAB program showing MFs and fuzzy rules, and 3D surface of the model. ing grid Partition technique using Matlab ANFIS tools. and the average deviation of 0.0005667 levels. 63.23%, and the average deviation of 0.1867251 levels. is loaded into the ANFIS tool. average deviation of 0.0870766 levels. Figure 8. 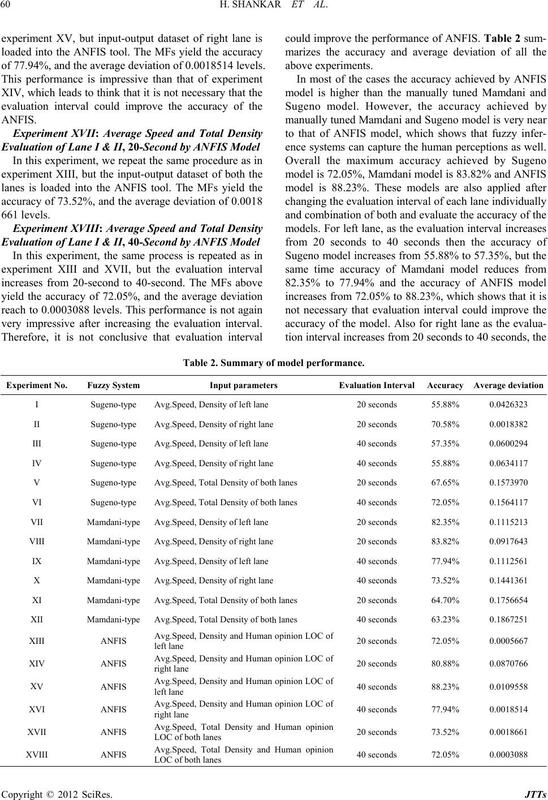 (a) Training and FIS output; (b) ANFIS model str ucture . of 77.94%, and the average deviation of 0.0018514 levels. ence systems can capture the human perceptions as well. 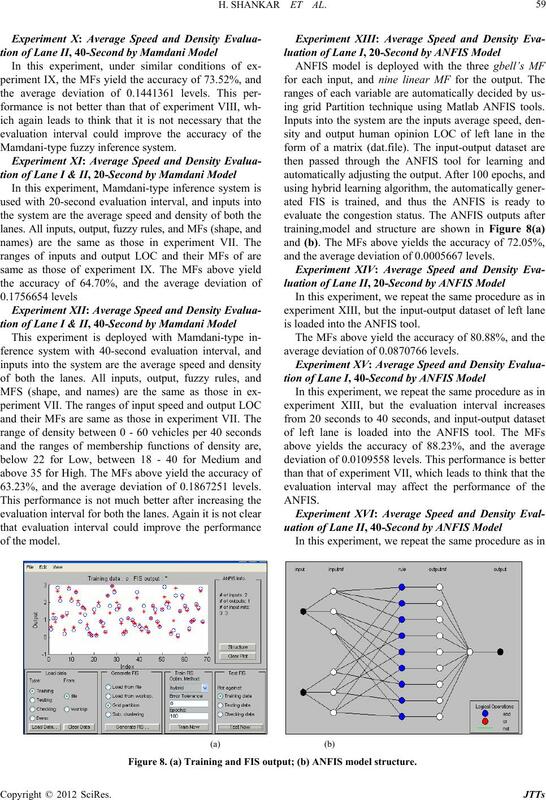 very impressive after increasing the evaluation interval. uld im the performace of the model. evaluation interval affects the accuracy of the system. roads which can be used in the network analysis in GIS. 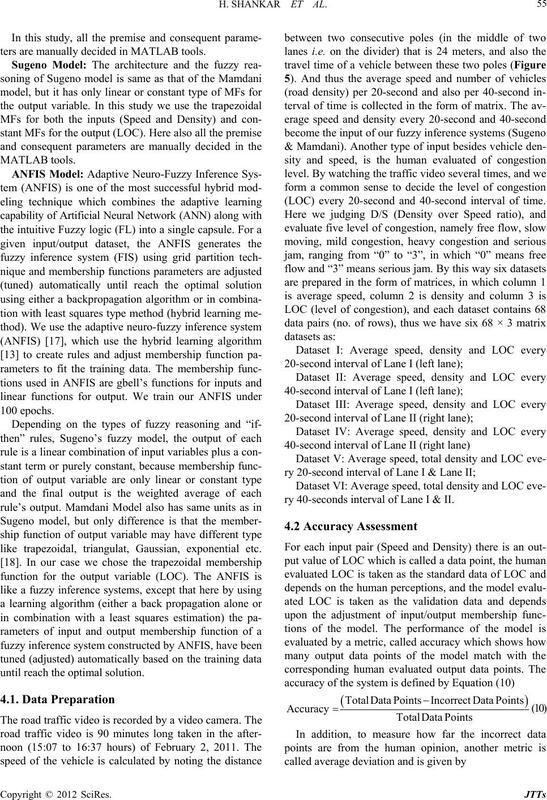 lated which can be used in temporal network analysis. etics, Vol. 20, No. 2, 1990, pp. 419-435. Chengdu, June 2006, pp. 1001-1004. 8-11 September 1996, pp. 1832-1837. Roorkee, 12-15 December 1988, pp. 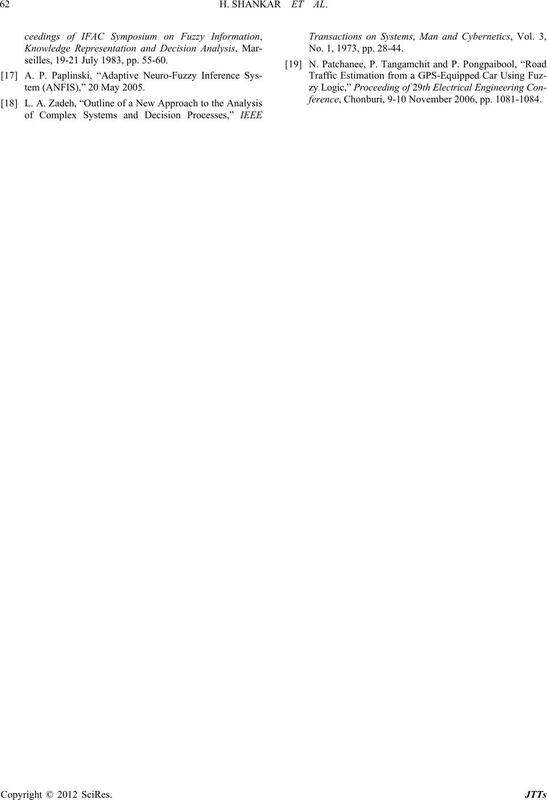 518-527.
gent Transportation Systems, Vol. 1, 2003, pp. 50-53. No. 12, 2010, pp. 747-759. No. 1, 1973, pp. 28-44.
seilles, 19-21 July 1983, pp. 55-60.
ference, Chonburi, 9-10 November 2006, pp. 1081-1084.